Summary:Anna has everything figured out - she was about to start senior year with her best friend, she had a great weekend job, and her huge work crush looked as if it might finally be going somewhere... Until her dad decides to send her 4383 miles away to Paris. On her own. 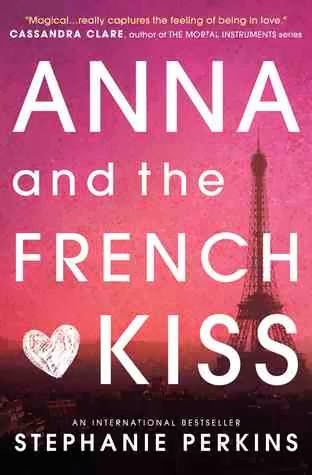 Review: I'd heard so much amazing things about Anna and the French kiss. So when Usbourne sent me a copy I was expecting good things. It was nothing but that. Such an epic romantic love story. There is so much tragedy in love stories so it's always nice to find one you can really relate to. Your first big crush, your first " moving out and being a grown up" experience. Stephanie has made me want to visit Paris again. Not just visit! I want to pack up my life and move there. With a lot of YA set in different countries I've read, sometimes I don't get the feel for the area. But through this novel I got an amazing sense of Paris. I think Stephanie's writing is FANTASTIC! so charismatic! but also I found it very humorous... People do have fun and laugh in relationships and it was so refreshing to see. I loved the characters in this novel! Especially Anna and St Clair. Always with love interests I've noticed things can be a little rushed in books. This relationship was paced beautifully. I couldn't wait for their scenes together. Their banter and the way they spoke to each other was addicting. And of course the sexual tension was sky high. It kept you on the edge if your seat with the thought "will they? Won't they?" I have one word to describe this novel. Refreshing. There is so much dark stuff out right now, that if you're looking for a beautiful contemporary romance set in one of the most beautiful cities in the world then it's time you get this bad boy. I can see why Usborne want to publish it this year. Its going to be a best seller in the UK for sure. I loved this book. I bought the entire series after I read this book, and I can’t wait to read the other two books. Such a great romance with a healthy dose of friendship and teenage angst set in a beautiful foreign locale. What more could you ask for?